Three mountains and five hills of Napa Valley sourced the fruit for a flight of top Napa big reds.The greatest joy of having a wine cellar collection is to pull special bottles for a special occasion such as a festive holiday dinner. Tonight provided the opportunity to showcase a line-up of favorite Napa Reds with beef tenderloin. Linda prepared her delectable beef tenderloin and imaginative twice baked potatoes, brussel sprouts, hericot verts and fresh dinner rolls. I pulled decade plus one year old Napa big reds to highlight the meal. Showcasing our favored Napa mountain fruits profile, we tasted wines from three corners of Napa Valley. I wrote recently about the distinctive Howell Mountain terroir. We featured Howell Mountain Clark Claudon, Fantesca Estate from the opposing Spring Mountain District, and a pair of David Arthur wines from Pritchard Hill in the southeast corner of the valley. To round out the flight, Bill brought from his cellar Quintessa from the geographic center of that triangle featuring its five hills estate, and David Arthur Elevation 1147. To accompany the flight, Bob brought a St Emilion Grand Cru Bordeaux. Visits to the estate wineries of Fantesca, David Arthur and Quintessa have been highlights of several of our Napa Valley Wine Experience excursions, and Tom and Laurie Clark-Claudon were featured producers at one of Napa wine producer dinners. Indeed, we hold close to a dozen vintages of each of these producers - certainly of Clark Claudon and David Arthur, both in about their 25th year or so of production. For Fantesca, they've just finished their first decade since their 2004 inaugural release, when Duane and Susan Hoff took over the estate. 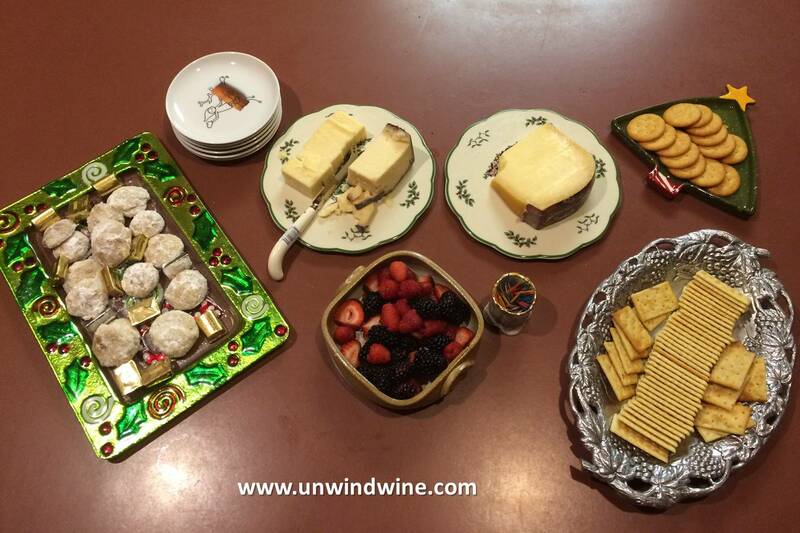 Prior to dinner, we featured a selection of artisan cheeses and Linda prepared her baked brie with toasted nuts and berry puree, accompanied by an Austrian Riesling and Italian aperitif wine. As mentioned, our visits to the spectacular Spring Mountain Estate of Duane and Susan Hoff have been highlights of our Napa wine excursions in 2007 and 2009. We hosted Duane at our home on one of his first release tours when he was traveling the country building the Fantesca brand. Their classic packaging with their etched glass bottles provide a festive bottle for such a gala dinner. Dark garnet colored, medium-full bodied, at eleven years, the complex Spring Mountain bright forward fruit flavors of cherry, black berry and black currant are giving way to a layer of cassis, tobacco, black tea and hints of dark chocolate and dried herbs with a refined tannin finish. We hold more than a dozen vintages of this wine going back to their early releases in the mid-nineties. Deep inky garnet colored, full bodied - aromas of ripe dark berry fruits, big mouth-full of forward complex but balanced, smooth, spicy black cherry and black currant and edge of red berry fruits, tones of cassis and dark mocha and turning to a predominant forward accent of sweet smooth sweet spicy oak on the smooth tannin finish. As I have written in these pages, Meritage is the trademarked/licensed label attached to American releases of Bordeaux varietal blend wines. 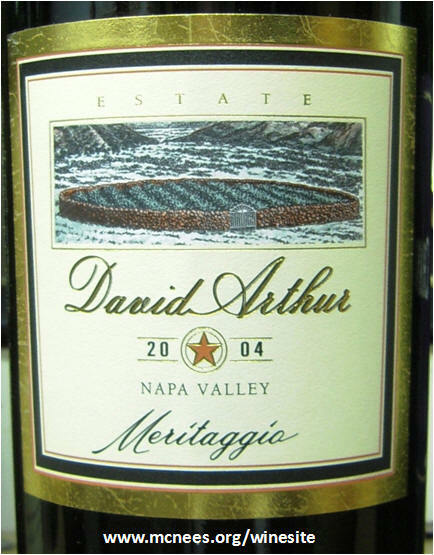 David Arthur uses creative license with this play on words to bring us 'Meritaggio', an Italian influenced Napa Valley blend of Bordeaux varietals accented by the Italian varietal Sangiovese - that associated with 'Super Tuscan' wines. 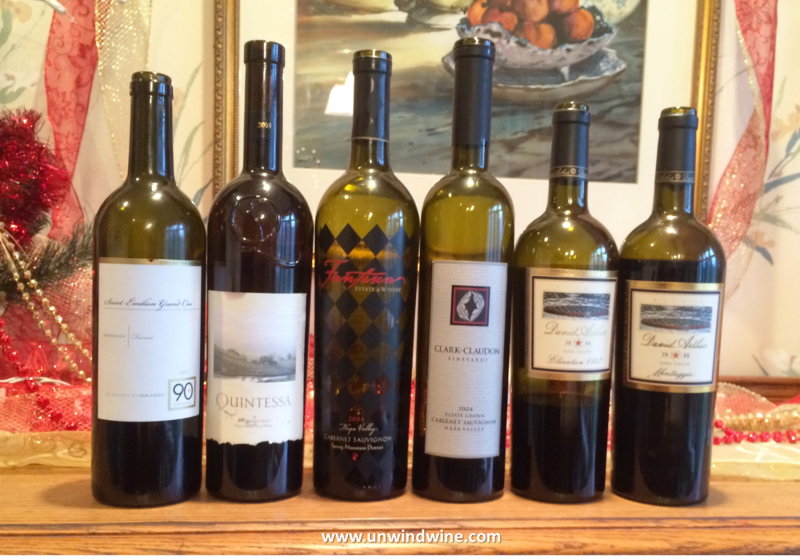 I thought this would provide an interesting comparison to the other Napa cabs, perhaps more approachable easier drinking early in the wine flight. Wow, what a surprise as this presented a big firm tight profile that ended up being the culmination (end) of the flight, with its firmness and complexity overpowering the rest of the wines. As I update my records of this wine tasting depletion from our cellar, I realize we have a half dozen vintages of this label. I'll be mindful how to position this wine in future tastings. This wine, a super Tuscan style blend anchored by Bordeaux varietal Cabernet Sauvignon (68%) with 12% Sangiovese made for an interesting diversion in the flight. The big full black berry and black raspberry fruits gave way to a layer of creosote with tones of dark mocha, black tea and leather with hints of vanilla and smoke on the firm gripping tannin finish. 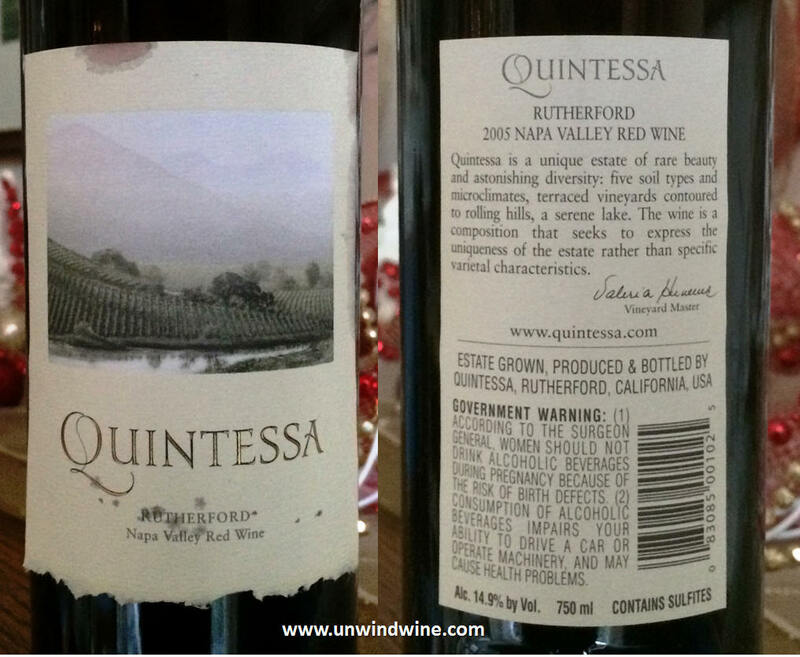 The name Quintessa refers to the five hills on the Rutherford estate property. 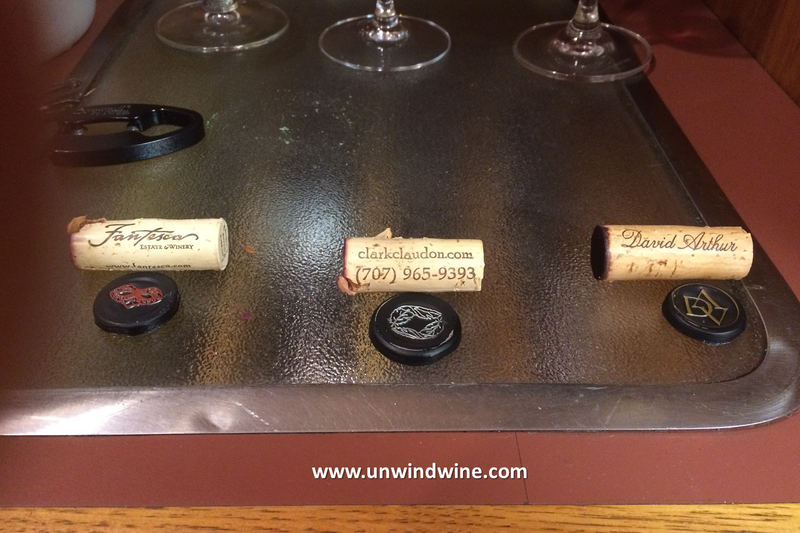 Our tasting at the stylish winery estate on Silverado Trail was a highlight of our Napa Wine Experience 2003. This was lighter than expected and ended up being our opening red wine providing the transition from the pre-dinner whites to the big reds. Dark garnet colored, medium-full bodied, smooth, elegant and polished with bright vibrant dark berry fruit flavors accented by huge floral bouquet, tones of violet, cola and hint of clove spice with tangy bright acidity on the smokey tannin laced finish. "Excellent transition wine from pre dinner whites to the heavier Napa cabs served with beef tenderloin. This was lather than I remembered. Still the same characteristics though. A hint of clove and spice on the nose. Bright plum, cassis and a bit of cherry on the palate with a medium finish. This needs at least 30 minutes of air to reveal the fruit and complexity. Was a but surprised that this did not have the same weight or body of the '04 Fantesca or Clark Claudon that followed." Of course the name refers to the topographical elevation of the vineyard from which this single vineyard designated fruit is sourced. "Elevation is flawless, extraordinary in its refined elegance and harmonious balance. While full bodied it has no sense of weight in its symphony of seamlessly integrated flavors, silky smooth and polished balance of floral, dark fruit and accent tones from start to finish - lavender, sweet ripe black and blue berry fruits, whispers of cinnamon, clove, exotic spices and tobacco leaf on the soft lingering finish. At eleven years of age it seemed to be at its apex as I can't imagine it getting any better. It was delightful and delicious. 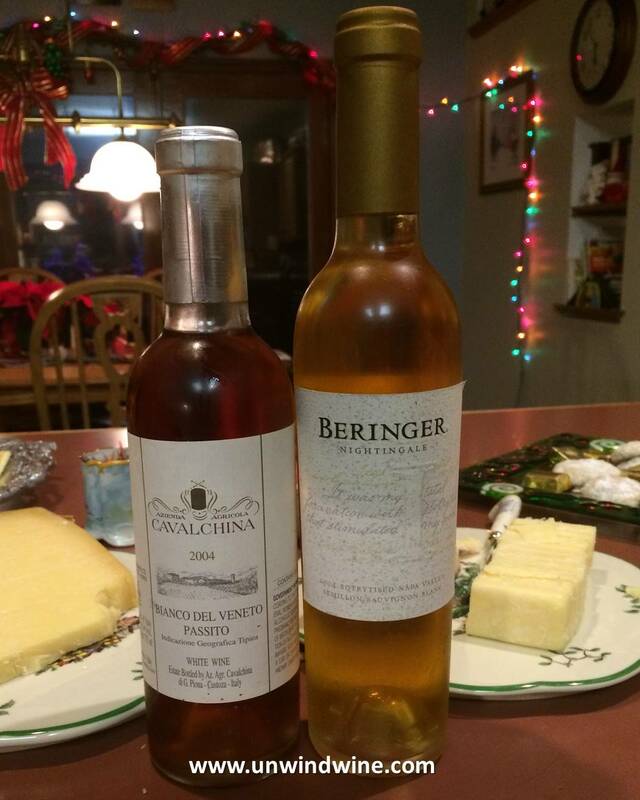 I sense I drank my earlier Elevations too early to allow them to come together so nicely." Bill's tasting note on Cellartracker - "Love the depth and complexity of this wine. Earthy Bordeaux like nose of moss and forest floor. Blackberry, cola and tobacco on the palate. Deep indigo color. Full bodied with a long lingering finish. I have the sense that this will not improve with more age. Tannins are fully integrated." Bob brought this to contribute to the flight. I've written often herein about Ninety-Plus cellars negociant practice of obtaining surplus wine for private labeling. 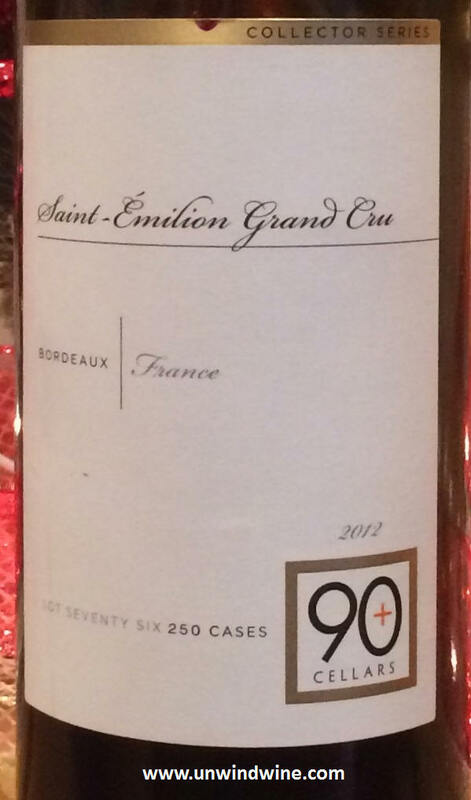 After pouring at the St Emilion Grand Cru producer's release event in Chicago last month, its hard to imagine a private label version of any of their wines. 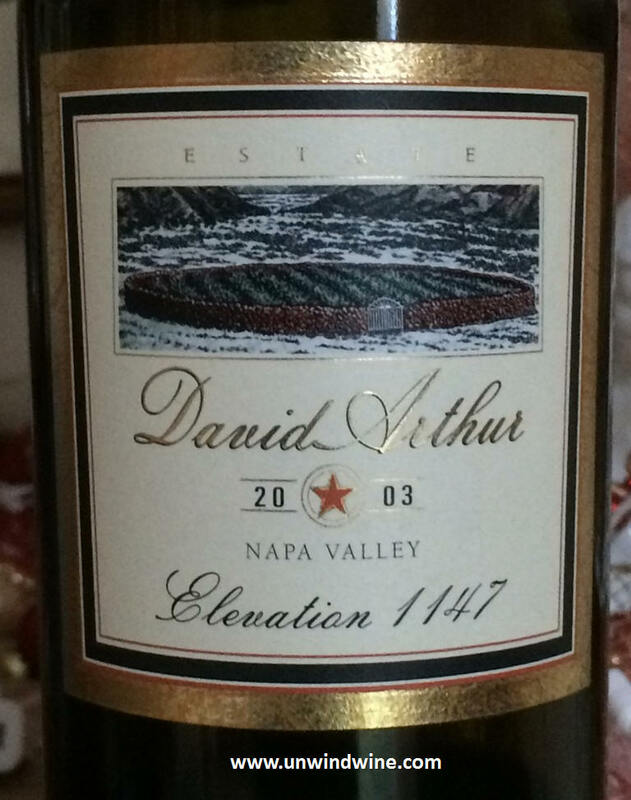 Deep inky garnet, medium bodied, rather subdued aromas and flavors of blackberries with under currant of purple/blue berry fruits accented by a layer of woody pain grille, earthy cedar with tight firm gripping tannins on the finish. Prior to dinner, we tasted a selection of whites with artisan cheeses, fresh fruit, holiday cookies and chocolates, and salad. 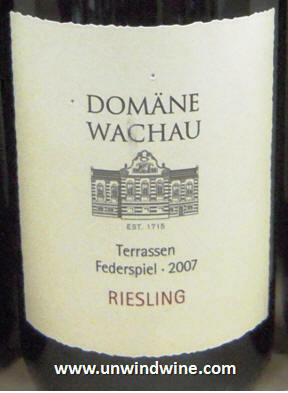 Straw colored, light-medium bodied, crisp clean, slightly tart citrus apple with stone fruit with bright acid finish. Originally straw colored, this has turned to tea color, medium bodied, the apple fruits, subtle tangerine and hint of apricot and peach flavors have given way, overtaken by tones of burnt caramel, smoke and nut on a flavorful lingering finish.